The GLAD PVQC Programs awarded “The Best Road Show Award” at the 20th China International Industry Fair, 2018, Shanghai, China. Global Learning & Assessment Development Company (GLAD), with operations in Irvine, CA. 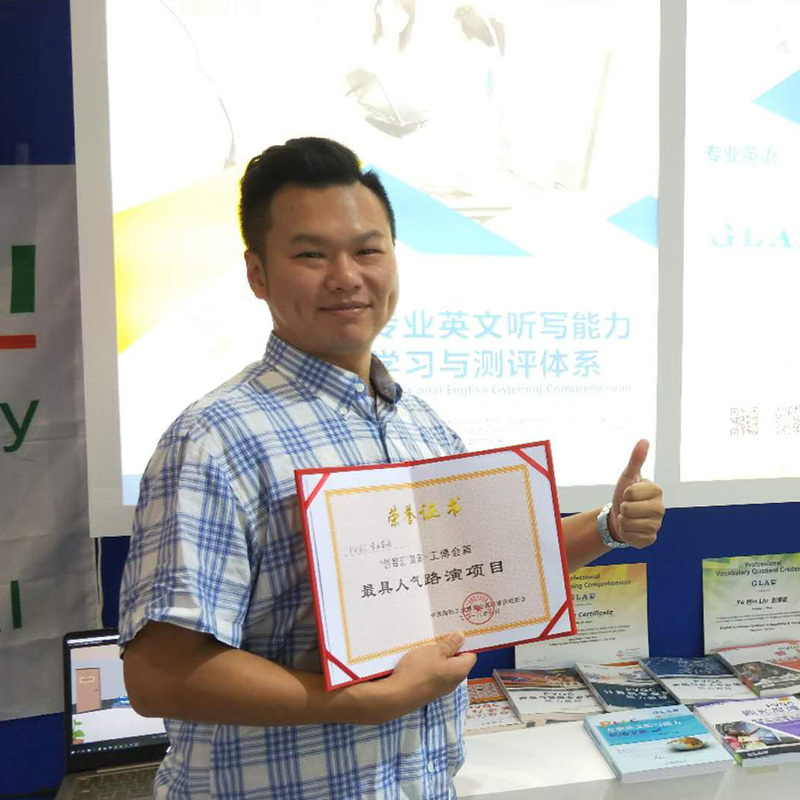 USA, in Toronto, Ontario, Canada and in Greater China Region (Taiwan, Hong Kong, Macao and mainland China), was awarded The Best Road Show Award in the 20th China International Industry Fair, 2018 (on Sep. 20-22), Shanghai, China, with its PVQC (Professional Vocabulary Quotient Credential) program. The PVQC programs include learning and assessment software, PVQC TESOL (Teaching English to Speakers Other Languages) program, learning resources and certifications. The 20th China International Industry Fair, 2018, Shanghai, China is held by China MOIT (Ministry of Industry and Information Technology), China NDRC (National Development and Reform Commission), China MOST (Ministry of Science and Technology), and Shanghai City Government in the National Exhibition and Convention Center (Shanghai) with 280 thousand square meters on Sep. 20-22. This year 175 colleges around the world were invited with 711 products. Please do not plan to test during the outage. All system connections with GLAD will be offline for maintenance. Updates will take place on Jun. 13 from 18:00 UTC to Jun. 13 23:00 UTC . GLAD and its major partners in Taiwan have successfully held the 2017 to 2018 competition for PVQC and PELC programs from Oct. 2017 to Jan. 2018. About 28,700 contestants from 170 colleges and high schools joined the competition. The Deputy Minister of education (Taiwan MOE)—Dr. Lin, presented the final awards at a ceremony on Jan. 29, 2018. The PVQC & PELC 2018 competitions and the ICT & BAP 2018 competitions were launched at the awards ceremony. Global Learning & Assessment Development Company (GLAD), with operations in Irvine, CA. USA, in Toronto, Ontario, Canada and in Greater China Region (Taiwan, Hong Kong, Macao and mainland China) is pleased to announce the development of a new training program called GLAD TESOL for PVQC/PELC program. The GLAD TESOL (Teaching English to Speakers Other Language) program is a training course for teachers to teach English using GLAD PVQC and/or PELC (Professional Vocabulary Quotient Credential & Professional English Listening Comprehension) programs for their resources. The GLAD TESOL for PVQC/PELC program includes the instructional design, instructional methods and teaching material for teachers to use the PVQC and/or PELC programs. The training period is about 4 days (24 hours). The teacher will be granted a PVQC/PELC-TESOL certificate if she/he passes the requirements in the training course. Remark: TESOL is a registered trademark of TESOL International Association or its respective owner. GLAD and its major partners in Taiwan have successfully held the 2015 competition for PVQC and PELC programs from Oct. 2016 to Jan. 2017.
presented the final awards at a ceremony on Jan. 23, 2017. The PVQC & PELC 2017 competitions and the ICT & BAP 2017 competitions were launched at the awards ceremony. GLAD's professional certification is recognized by Arvind Limited, one of India's largest textile manufacturers . Arvind Limited (formerly Arvind Mills) is a textile manufacturer and the flagship company of the Lalbhai Group. Its headquarters is in Naroda, Ahmedabad, Gujarat, India. It has units at Santej (near Kalol). Irvine, CA, USA and Beijing, China—Aug. 18, 2016—Global Learning & Assessment Development Company (GLAD), with operations in Irvine, CA. USA, in Toronto, Ontario, Canada and in Greater China Region (Taiwan, Hong Kong, Macao and mainland China) has successfully held the IT and Professional English Competitions for Greater China Region in Taipei on Aug. 18, 2016. This is the 6th annual completion in the Greater China Region. This year had 12 winning schools from about 250 schools in mainland China and 25 winning schools from 120 schools in Taiwan for a total of 37 schools. This contest included both student and teacher competitions. GLAD 2016 Competitions are designed to meet the needs of learning IoT (Internet of Things) essential technology and Makers' education. The GLAD ICT & BAP 2016 Competitions are from Jan. 22, 2016 to March 26, 2016. The GLAD PVQC & PELC 2016 Competitions are from July 1, 2016 to Jan. 16, 2017. The information technology competency competitions are from Jan. 1 to Aug. 15, 2016. GLAD and its major partners in Taiwan have successfully held the 2015 competition for PVQC and PELC programs from Oct. 2015 to Jan. 2016.
presented the final awards at a ceremony on Jan. 21, 2016. The PVQC & PELC 2016 competitions and the ICT & BAP 2016 competitions were launched at the awards ceremony. GLAD would like to thank the academic partners who hosted the competitions in 6 districts and the final award ceremony: Tungnan University, National Ilan University (NIU), Chien Hsin University of Science and Technology (UCH), Chung Chou University of Science and Technology, Cheng-Shiu University (CSU), Chia Nan University of Pharmacy and Science (CNU), and National Taiwan Normal University (NTNU). Irvine, CA, USA and Beijing, China—March 24, 2015—Global Learning & Assessment Development Company (GLAD), with operations in Irvine, CA. USA, in Toronto, Canada and in Greater China Region (Taiwan, Hong Kong, Macao and mainland China) has adopted the technology-leading platform for learning and assessments provided by Integrea. Focusing on the language and technical skills needed for vocational success, GLAD serves targeted vertical markets with fresh, custom-designed learning content and assessments. GLAD® , PVQC® , PELC® , BAP® , ICT® , DMT® , MDA® , and Typing Credential®, Doorway, MDP, MPP are trademarked by Global Learning and Assessment Development (GLAD). CompTIA® is the trademark of Computing Technology Industry Association, Inc. Microsoft®, Office®, Word®, Excel®, PowerPoint® are logos or trademarks of Microsoft Inc. in the United States and/or othercountries. CIW® is the trademark of Certification Partners, LLC. Google®, Android®, and Google Documents, Google Spreadsheets, and Google Presentations are registered trademarks or logos of Google Inc. Apple®, iOS®, iWork are either registered trademarks or trademarks of Apple Inc. Adobe®, Photoshop®, Illustrator® and InDesign® are either registered trademarks or trademarks of Adobe® Systems. ATP is the trademark of Association of Test Publishers. TOEIC®, TOEFL® are either registered trademarks or trademarks of ETS® (Educational Testing Service).